"Grab Negative Beliefs & Muddled Thinking By The Throat, Slap 'Em In The Face, Throw 'Em On The Ground And Smash 'Em To Pieces!" Success Leaves Clues–So Does Big, Stinky Failure! I’m sure you’ve heard the saying, “Success leaves clues.” It’s true. Well, failure leaves clues too. So does mediocrity. There are clues are in the language patterns people use that reveal the beliefs that keep them stuck, the attitudes that fail them, the things they are not seeing that could help them over the hump. 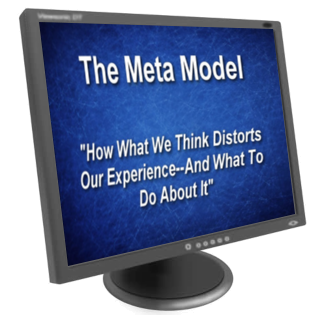 The Meta Model helps us to precisely root out those clues and challenge the thinking that creates failures, problems and being stuck. And it gives you specific, effective challenges to that thinking! You can use it on yourself, you can use it on clients, you can use it in debates, in persuasion–in just about any situation. What I lay out in this program is not only the Meta Model patterns, but a strategy for their use. Learning the patterns only is like getting a giant pile of 2×4 boards and being told to go build a house. You don’t have much of a chance of building a good one without a plan. I’ll give you that plan–a strategy that makes it easy to know how to recognize when to use the Meta Model, which patterns to use when and when not to use it (again, unless you want to piss someone off). It’s the strategy that takes it from a bunch of fancy-pants language to a precision tool. A tool you can use to be more effective with clients, or to root out your own un-resourceful thinking (We don’t have any of that, do we?). Once you start with the Meta Model it’s hard to keep belief patterns that hold you back. Don’t get it unless you’re ready to examine your own thinking and let some things go. Even if you just grab this program to help you be more effective with clients, you can’t help but apply it to yourself. And when you do, you’ll discover how ridiculous your limiting beliefs are. Then you’ll just have to obliterate them. Don’t say I didn’t warn you! Real Life Examples–So you can feel confident in your Meta Model skills. Complete Strategy For Use–You’ll know what to do when. Lost Performatives–Discover how to deal with this distorted thinking. Cause And Effect–What to do when negative beliefs come up in this format. Complex Equivalences–Powerfully hypnotic both positively and negatively. Learn how to stop the bad stuff. Presuppositions–Ericksonian hypnotic language turned around and negative. Stop it in its tracks. Universal Quantifiers–This one is always useful. Modal Operators–Discover how words such as should, must, need and others can limit us–and how o put a stop to it. Nominalizations–Another powerful hypnotic language component that can keep folks hypnotically stuck. Fix it in a jiffy. Unspecified Verbs–A sneaky deletion that won’t get past you again. Dangers Of The Meta Model–Yes there are some. Learn how to avoid them! BODACIOUS!! Wonderful, hilarious examples that stick in my mind. Great presenter, and thorough knowledge of material well clarified. I'm an NLP virgin and Keith made his presentation understandable to lay people, although may NLP professionals were in his audience. Keith answered questions with kindness and humor. Audience in rapt attention. VERY intriguing practical info. I was thrilled! Instant access, lifetime access, no shipping cost, environmentally friendly.